Don C & Rémy Martin Announce Limited-Edition Luxury Capsule Collection | RESPECT. Rémy Martin announces the launch of The Collector’s Series, a program that celebrates the premium promise of Rémy Martin through the collaboration of leading lifestyle brands and designers. Kicking off The Collector’s Series is an exclusive, “Just Rémy,” capsule collection designed by world-renowned streetwear designer and cultural icon Don C. The collection highlights both his and Rémy Martin’s unparalleled prowess and superior craftmanship in the lifestyle world. The partnership intertwines fashion, basketball and luxury to create signature pieces exemplary of the iconic Rémy Martin brand. 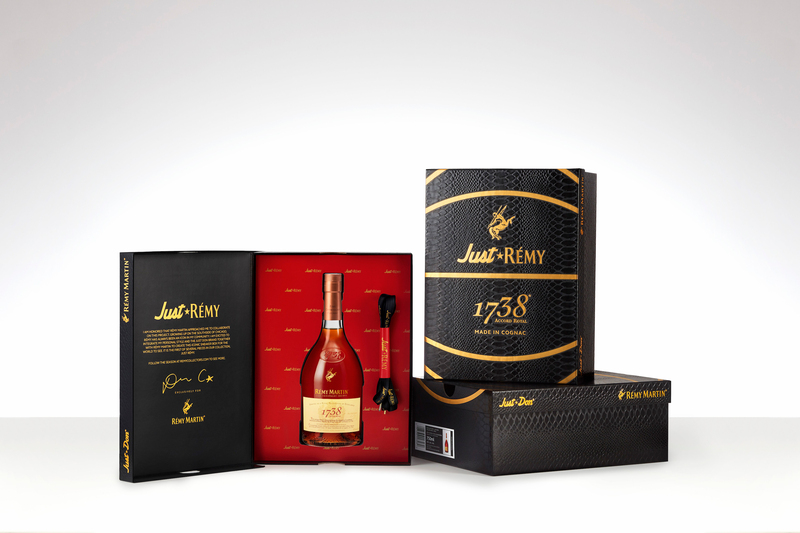 The first in the “Just Rémy” collection to release is the 1738 Sneaker Box, patterned intricately with Just Don’s iconic snake skin detailing and featuring a bottle of premium Rémy Martin 1738 Accord Royal with branded “Just Rémy” sneaker laces. The “Just Rémy” collection was inspired by the creative processes of both Rémy Martin and Don C. Rémy Martin’s masterful production and blending of cognac to create ultra-premium products is mirrored in Don C’s ability to create cutting-edge, high-quality pieces that consistently push boundaries in fashion. One entity seamlessly embodies the other, whether it be through the lens of luxury lifestyle, premium quality or a dedicated following. With a focus on basketball culture for the “Just Rémy” collection, Rémy Martin and Don C present luxury basketball essentials that double as timeless lifestyle pieces that are essential beyond the court. The “Just Remy” collection celebrates the fashion and luxury components of basketball culture and creates an all-encompassing experience before and after game time. Rémy Martin’s presence at the crossroads of luxury and lifestyle has drawn inspiration for the “The Collector’s Series.” Each capsule collection in the series will feature a different brand at the intersection of sport, design and lifestyle, in collaboration with Rémy Martin, to create a lifestyle movement bred by culture. The launch of the series will start in Chicago with the debut of the Sneaker Box, which will be available at retail nationally with SRP $60. The multiple piece collection will stretch from now through February with a new item released in a new market each month.